Taking a half day, we load the car, skip the Friday afternoon Cape Town traffic and off we go. A weekend away for our group often means a two-hour drive to a sea-side destination like Hermanus or venturing up the West Coast for some seafood, sun and swims in Paternoster. This time, we opted for the Great Karoo. Driving the almost desolate landscape for four hours we arrive at sundown. 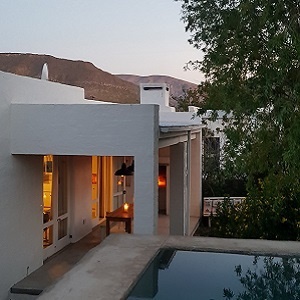 Welcomed with the perfect view of The Swartberg Mountains, we pop a bottle of Méthode Cap Classique (MCC) and light a braai. With a predicted 32°C on Saturday, we wake up early to visit one of the town's top attractions, Gay’s (Guernsey) Dairy. According to the website, "Gay van Hasselt started what is now known as Gay’s Guernsey Dairy in 1990 when she started milking three cows in a stone kraal. She soon discovered that there was a demand for fresh milk in the community and started selling to a few customers who would arrive with their empty containers and get their daily supply of milk while on their morning walks." A short 5-minute walk from our guesthouse sits this quaint dairy. Simple, unpretentious and absolutely magnificent. We enter and are immediately met by the friendly face of Gay. We poke our heads into the cheese room, where we are greeted by the friendly staff who happily offer you however many slivers of cheese you want to test. Pepper-infused, with olives or extra mature, you can have your pick. In our case, we picked (and subsequently purchased) almost all. The dairy also offers a meat room, hosting a variety of locally produced Karoo Lamb and dried meats. After Gay's we decided to walk down the main road. Like many small towns, there is really nothing but a main road. It is all that matters. And in Prince Albert, the main road really matters. Dotted with cute restaurants, coffee shops, boutiques offering Mohair, Karoo lamb, olives and second-hand goods, the smell of pancakes and cinnamon hung in the air. The waft came from outside the local NG Kerk, as local tannies prepared and served peckish patrons. Further down the road we stumbled upon the Unfiltered Saturday Market. Jaffles, olives and organic Boereraad remedies aplenty. We pried ourselves away from the market and continued down the main road which is lined with beauty. Bougainvillea, my favourite, grows here like weeds, with one bed and breakfast even adopting the name 'Bougain Villa'. It was around 10:30 am and the town was bustling. We had a plastic bag filled with cheese, pear and caramel yogurt, biltong, and 3.5 kg of olives. The day was off to a good start. We spot a man across the road hosting a small second-hand and vintage goods sale in his garage. Intrigued, we approach, as kleindorpie vintage is far superior than inner city retro finds in our opinion. We mention to the man who introduces himself as Louis, that we love the little town and the atmosphere. He says, yes, that it is. But by early afternoon the town will be dead. By 2pm the town was silent as a tomb. Were locals taking in long afternoon naps, watching TV or simply enjoying a cup of coffee on their stoep? We weren't sure, but we lazed by the pool contemplating the simple life as a true option for our future. Maybe it was the cheese, the quiet, or the fact that everyone in this town were so ridiculously lovely and forthcoming (a special shoutout to the folks we shared a drink with and watched rugby with at the local watering hole); but life in the slow lane (with a hint of hedonism) suddenly seemed the only way to be. Here is a list of more things to do in Prince Albert.